Sean Dyche can understand the parameters he has to work under as he looks to add to his squad. But he feels Burnley have to adapt to an inflated transfer market and stretch the budget as far as possible. Dyche is expected to have the smallest budget in the Premier League, as he had two years ago, and has so far only been able to add Johan Berg Gudmundsson and Nick Pope to his group. And he admitted: “It’s reality, frustration, the toughness of the challenge, all wrapped into one. “It’s very tough recruiting, not just for us, the market is forever going north. “Contractually it’s even more tough, even if you get the fee sorted. Asked if there was a player he’d blow apart the wage structure for, he said: “It’s not about that, the club won’t do that. I’d push it and push it, but the club give me certain ways of working. “I sort of understand it, as a manager, I try and manage the situation, not just the team, and as a club, there has to be a future. “That’s why two years ago we put the structure right, because it was built on sand without a proper training ground. “I think that’s really important, so I wouldn’t throw it all at it. “But we have to stretch it, because the market is out of our control. We’re not the market leaders, the ones controlling it, we’re adapting to it. He won’t sign players for the sake of it either: “The whole point of signing players, apart from youngsters to develop, is to better what you have. “There’s no point signing the same, I don’t see the point. They have to have something that allows them to grow and mature to be better, or they are better at this moment. 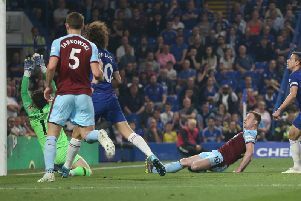 Burnley have never had a bigger tranfer budget, but wages are the most difficult issue: “Wages are the biggest challenge because they are ongoing costs. “If we’ve got an amount for fees, which we have, they’re more or less parked. “That investment is also still with you and possibly growing. “The wages are year on year, and that’s where clubs have got in bad shape. It makes it tough for me, even though I understand it. Burnley are debt free, unlike several of their rivals, but without a sugar daddy prepared to write off any debt, they have to live within their means: “The deals are very difficult, apart for the super powers. “It’s a tough market, and most clubs are willing to go into considerable debt. “This club doesn’t want to do that, and I understand it, and find it challenging in equal measure. “After what we’ve achieved here in three and a half years, I don’t want to leave that in rack and ruin just to please myself. “Just throw it all on the pitch, and if it doesn’t work, sail off into the night leaving the mess behind me, that’s not my bag. “I must make it clear, if an owner allowed me to do that, I would, the owner would cover the club and invest and go for it, that’s a different ball game. “I’d sign him and him, and pay him and him, I want to be successful myself and be in the Premier League - I’ve earned the right to be here twice. “If the owner doesn’t want to do that, I have a responsibility to say, I understand, give me what it is and I’ll manage that. Even trying to cherry pick from the Championship is proving tricky: “Let’s say some of our market is the Championship – the owners there are worth hundreds of millions.